This iron does numerous things. It is the future of irons. It creates volume, straightens, curls and does waves all at once. The iron is 1" in diameter. The iron has a programmable temperature setting. It heats up to 450°F in 30 seconds! It is made of 1" premium IsoTherm titanium plates that provide fast, even heat. SmartSense microchip regulates temperature 50 times per second. There is an exterior LED display. It has dual voltage for worldwide usage. And finally it has customizable auto shut-off. As an added bonus its contoured shape creates perfect volume, curls and waves. It also straightens. Here I had my hair straightened, as it is normally slightly wavy. 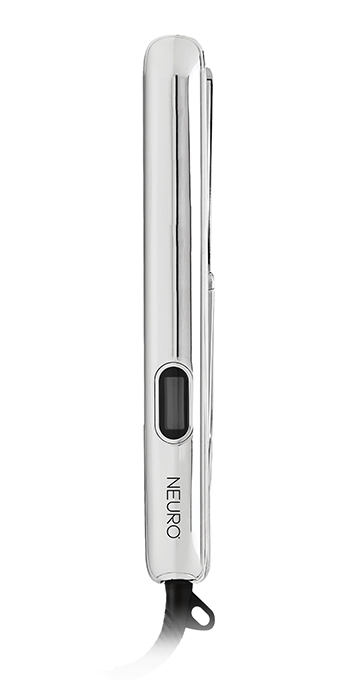 The Neuro Style Metal Tech Collection is available at Paul Mitchell Salons and Schools. It is $149.99. Like Paul Mitchell on Facebook: https://www.facebook.com/PaulMitchellHairCareUS; Follow Paul Mitchell on Twitter: @PaulMitchellUS; Follow Paul Mitchell on Google+: https://plus.google.com/u/0/114937314110442533325/posts; Follow Paul Mitchell on Pinterest: http://www.pinterest.com/paulmitchellus/; Follow Paul Mitchell on Instagram: http://instagram.com/PaulMitchellUS and Subscribe to Paul Mitchell on YouTube: https://www.youtube.com/user/PaulMitchellChannel.